As we approached the end of the year 2013 I began to think of the wonderful places I visited and the photos I made. What photo stands out as the “photo of the year”? I have some unique photos, and I have other photos from places I have photographed many times. I won’t say that this is the best photo I made during the year, but it is one with great meaning to multitudes of Christians. 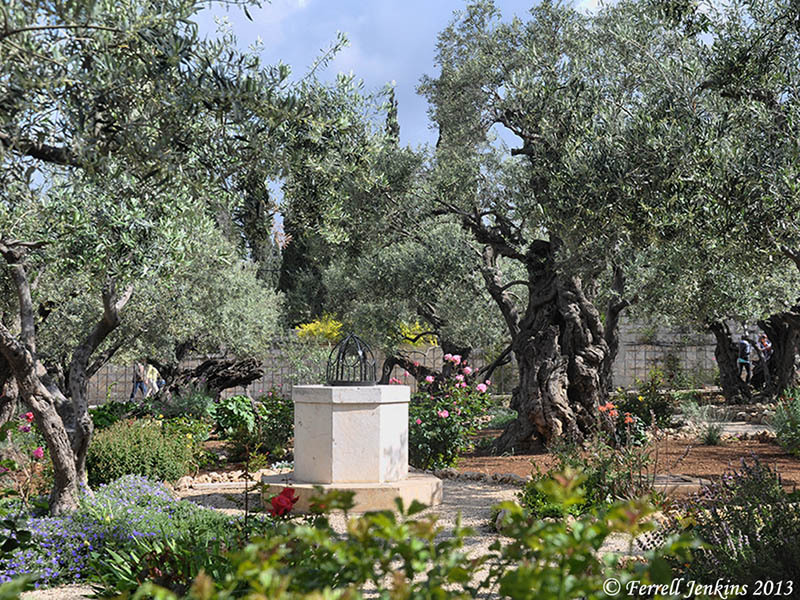 This photo that I wish to share with you is of the traditional Garden of Gethsemane. One thing is for sure. If the “place” mentioned in the New Testament is not here, it could not have been very far away. Gethsemane is a place well known in the minds of Christians, for according to the Gospels it was there that Jesus prayed alone to the Father before his arrest and trial. The word Gethsemane means oil-press. It is the name of an olive orchard on the Mount of Olives. Not many olive trees remain on the mountain originally named for them. This photo was made in the modern Garden at the Church of All Nations. As a gift to our faithful readers I want to share a hi-res image suitable for teaching and preaching presentations. Click here for the larger image. A place called Gethsemane. Photo by Ferrell Jenkins, 2013. Read the following verses for the complete story. I visited several places in 2013 that I have not yet written about. Hopefully I will be able to get to some of these in the following months. This entry was posted in Bible Places, Bible Study, Israel, New Testament, Photography, Travel and tagged Garden of Gethsemane, Ministry of Jesus. Bookmark the permalink. A beautiful photo and a nice place to meditate. Nice blog..Thanks for sharing it…. Thank you for sharing your expertise and also your pictures and your insights. They are sure appreciated!